Adapted from Statistics Canada http://www.statcan.gc.ca/pub/89-503-x/2010001/article/11387/tbl/tbl006-eng.htm, accessed January 15, 2012. The majority of women with children are employed, whether they are lone parents or have a partner. In 2009, 74% of mothers who had at least one child under 16 and who were with a partner were employed, as were 69% of lone-parent mothers. 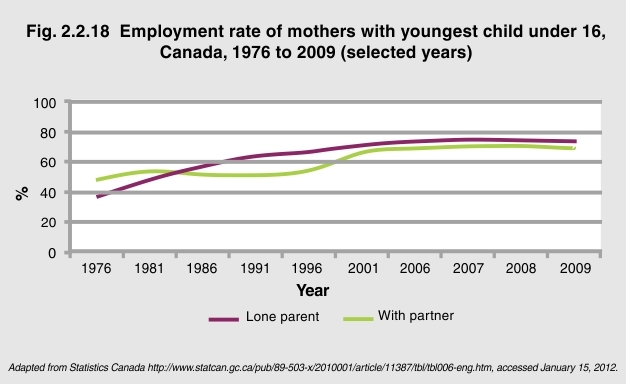 This is a 95% increase for mothers with partners and a 44% increase for lone-parent mothers since 1976. The employment rate of women with children under 16 has remained relatively stable since 2001.